The Hypothetical Development Organization‘s debut project took place in New Orleans, and was later included in “Spontaneous Interventions,” the U.S. exhibition at that 2012 Venice Architecture Biennale. 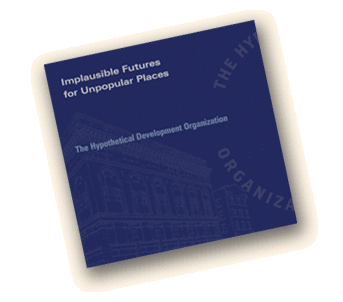 The Hypothetical Development Organization is dedicated to a new form of built-environment storytelling. Founders – design writer Rob Walker, photographer Ellen Susan, and publisher G. K. Darby – commissioned architects, designers, and artists to take existing sites, often run-down, vacant buildings, and reimagine them as fantastic pieces of architecture. These fictions were rendered on 3-by-5-foot posters (modeled on conventional developer advertisements) and posted on ten locations in New Orleans, transforming each into a site of engagement, provocation, and imagination. Examples include the Museum of the Self, featuring a thumbs-up “like” icon as a marquee; a boutique maker of artisanal velvet ropes (because “boutiques and artisanal products signal exclusivity, and thus economic vitality”), and the Loitering Centre, a perfectly reasonable use for unused spaces. The project involved identifying vacant/abandoned properties in New Orleans; inventing obviously absurd (provocative, whimsical) future uses for them; and having renderings of these hypothetical developments printed on professional-grade signage that was posted (without permission) on the structures in question. To pay for the sign production, HDO raised $4,197 on Kickstarter. Participating artists, architects, photographers, place-finders, concept inventors, confederates, and invaluable friends: anthonyturducken, John Becker, Morris Brum, Candy Chang, Mark Clayton, Carey Clouse, Michael Doyle, Mauricio Espinosa, Charles Franklin, Christina Hilliard and Lauren Stewart, Kirsten Hively, Nicole Lavelle, Chris Owen, Sergio Humberto Padilla, Dave Pinter, The School of Visual Arts Masters of Professional Studies in Branding Class of 2011, Jennifer Shaw, Meg Turner. As late as August 2014, at least one of the signs was still up in New Orleans and getting attention from Curbed, which reported on it here. Read the HDO essay here. For more thorough documentation of the project, HypotheticalDevelopment.com, and our Facebook page. Or, better yet, obtain a copy of definitive book-form summation, Implausible Futures for Unpopular Places.